The trouble with working on a secret project is that you can’t talk about it or post photos of it. It’s a black hole until it’s done and delivered. The only thing you can do is post a blank Ravelry project to taunt the recipient with its progress, which is darned good fun. This was made for a Ravelry swap and sent to San Antonio TX, so it had to work for hot weather. I’ve never done lace in worsted weight before, never in a cotton blend, and never made an all-over lace shawl, so this was a good experience. Did the joins by knitting with both strands for a few stitches and it worked really well. It knit up much faster than I was expecting, six days start to finish. Made some modifications because I can’t follow instructions. I did an extra repeat of the lace pattern before starting the border, changed the border to preserve the purled columns, and improvised the points. Started the third ball of yarn the row before the border and made it through 8 rows before casting off. 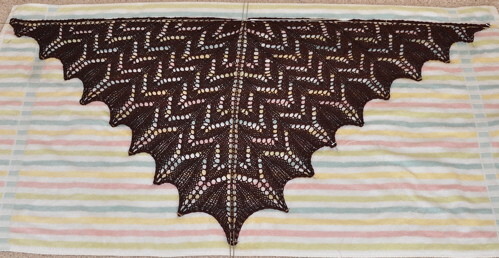 The shawlette called for the maiden voyage of my blocking wires, and I love them! The wires made it easy, two across the top and two down the spine, with pins to pull out the points. Blocked it as viciously as I could, left it two days to dry, and it came out perfect. The finished wingspan is 22 inches, and it’s 22 inches down the spine. Symmetry makes me happy.